The earrings and backs are crafted in solid 18K Yellow Gold and weigh 2.47 grams. You are going to love the double prongs with tulip setting. The earrings feature friction backs and are for pierced ears. These cute and dainty flower stud earrings are designed with round cut citrine gemstones accentuated in created white diamonds totaling 2 Ct. The studs are finished in 14k solid yellow gold and safely secured with baby screwback closure. These cute flower earrings feature a round cut citrine gemstone accentuated in six created white diamonds totaling 1.40 Ct. The studs are finished in 14k solid yellow gold and safely secured with baby screwback closure. Gold stud earrings are all the rage, and these 14K yellow gold diamond and citrine halo earrings are no exception. SimulatedDiamond Halo Stud Earrings. 14k Yellow Gold. Amorphous Diamond Simulants. Main Stone Shape. Gemstones: 2 pieces Genuine Citrine, Cushion Cut, 6 mm, 1.7 carats, Golden Pumpkin Orange Hue with Brilliant Sparkle. Earrings: 1.11 grams pure 14k Yelllow Gold with 14k stamp. Earrings feature exceptional Design, Craftsmanship and finishing. Perfect gift for Mothers Day, Birthdays, Valentines Day, Graduation, Christmas or just about any other occasion. Money Back Guarantee. Includes a Signature Gift Box..
Four earrings, 14k gold with genuine gemstones. Aquamarine, peridot, citrine and garnet. Gemstones: 2 pieces Genuine Citrine, Round Cut, 6 mm, 1.63 carats, Golden Pumpkin Orange Hue with Brilliant Sparkle. Earrings: 0.76 grams pure 14k Yelllow Gold with 14k stamp. Earrings feature exceptional Design, Craftsmanship and finishing. Perfect gift for Mothers Day, Birthdays, Valentines Day, Graduation, Christmas or just about any other occasion. Money Back Guarantee. Includes a Signature Gift Box..
Gemstones: 2 pieces Genuine Citrine, Princess Cut, 6 mm, 1.86 carats, Golden Pumpkin Orange Hue with Brilliant Sparkle. Earrings: 1.01 grams pure 14k Yelllow Gold with 14k stamp. Earrings feature exceptional Design, Craftsmanship and finishing. Perfect gift for Mothers Day, Birthdays, Valentines Day, Graduation, Christmas or just about any other occasion. Money Back Guarantee. Includes a Signature Gift Box.. These dainty stud earrings feature round cut created white diamonds accentuated in citrine gemstones totaling 0.70 Ct. The studs are safely secured with baby screwback closure and finished in 14K solid yellow gold. These beautiful birthstone flower earrings feature a round-cut created diamond center stone surrounded by yellow citrine stones and small created diamonds. These amazing floral studs are set in 14k yellow gold. Gold stud earrings are all the rage, and these 14K white gold simulated diamond and citrine halo earrings are no exception. Simulated Diamond Halo Stud Earrings. 14k White Gold. Amorphous Diamond Simulants. Gemstones: 2 pieces Genuine Citrine, Radiant Cut, 7 x 5 mm, 1.67 carats, Golden Pumpkin Orange Hue with Brilliant Sparkle. Earrings: 1.03 grams pure 14k Yelllow Gold with 14k stamp. Earrings feature exceptional Design, Craftsmanship and finishing. Perfect gift for Mothers Day, Birthdays, Valentines Day, Graduation, Christmas or just about any other occasion. Money Back Guarantee. Includes a Signature Gift Box..
Gemstones: 2 pieces Genuine Citrine, Heart Cut, 6 mm, 1.4 carats, Golden Pumpkin Orange Hue with Brilliant Sparkle. Earrings: 1.05 grams pure 14k Yelllow Gold with 14k stamp. Earrings feature exceptional Design, Craftsmanship and finishing. Perfect gift for Mothers Day, Birthdays, Valentines Day, Graduation, Christmas or just about any other occasion. Money Back Guarantee. 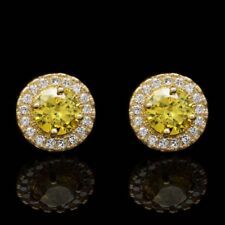 Includes a Signature Gift Box..
14K YELLOW GOLD ROUND SHAPE 2 TCW CITRINE STUD EARRINGS .#42. GEMSTONE : ROUND SHAPE CITRINE GEMSTONE APPROX 2. TOTAL CARAT WEIGHT. CONDITION : NEW. These enchanting earrings are beautifully crafted from 14k yellow gold. The heart-shaped citrine sits in the center of the earring. Heart Halo Stud Earrings. 14k Yellow Gold. Amorphous Diamond Simulants. These beautiful birthstone flower earrings feature a round-cut created diamond center stone surrounded by yellow citrine stones and small created diamonds. These amazing floral studs are set in 14k white gold. Both the earring and screw nut are are marked 14k and together weigh 1.9 gms. All of our jewelry is either new or in excellent - fine estate condition. Beautiful pair of earrings. They weigh 1.2 grams. Gemstones: 2 pieces Genuine Citrine, Oval Cut, 7 x 5 mm, 1.5 carats, Golden Pumpkin Orange Hue with Brilliant Sparkle. Earrings: 0.86 grams pure 14k Yelllow Gold with 14k stamp. Earrings feature exceptional Design, Craftsmanship and finishing. Perfect gift for Mothers Day, Birthdays, Valentines Day, Graduation, Christmas or just about any other occasion. Money Back Guarantee. Includes a Signature Gift Box.. These cute flower stud earrings are designed with round cut citrine gemstones accentuated in six dazzling created white diamonds. The studs are safely secured with baby screwback closure and and finished in 14k yellow gold. These High Quality Solid 14K Yellow Gold Martini Setting Diamond Stud Earrings with Screw Back for Pierced Ears, feature 2 Sparkling Rothem certified E color and I2 clarity Real and Rare Natural Earth Mined Conflict Free Round Brilliant Cut Diamonds totaling 0.66 carat. Brighten up your jewelry collection with this classy pair of 6 x 6mm round cut citrine stud earrings with screw earring backs. This delicate round &drop shape Earrings fits perfectly to the Filigree work and creates a Classic Earrings set. Filigree Earrings. The uniqueness of this Earrings is t hat they both stud & dangle, t he Earrings covering the ear piercing f rom one hand b ut its design remains as a dangle Earrings. Citrine Bracelets. Aquamarine Bracelets. Peridot Bracelets. Garnet Bracelets. Ruby Bracelets. Topaz Bracelets. Sapphire Bracelets. Citrine Earrings. You are looking at a charming pair of Ladies 10K Yellow Gold Heart Shaped Citrine and Diamond Fashion Pierced Earrings. ( 80 Points TGW) These Earrings are stylish and can be worn with any attire. DO NOT DUPLICATE OR COPY! 14kt Yellow Gold. Gold Purity & Color. Combined gemstone weight of 1/5 carats total weight represents a range of 0.18 - 0.22 cts. Our huge collection of products includes rings, fashion and wedding bands, bridal jewelry, pendants, gems and much more! These 14k petite white gold round citrine screw-back stud earrings feature 3 mm genuine natural citrines with a 0.16 ct total weight. Color Stones Change (White Topaz, Blue Sapphire, Ruby etc). We have also introduced Diamond jewelry in 925 Sterling Silver. Our range includes Rings, Earrings, Pendants and Mangalsutra. Want to add A personal touch to this piece?. Gemstone Type - Natural Citrine. We have also introduced Diamond jewelry in 92.5 Sterling Silver. Our range includes Rings, Earrings, Pendants and Mangalsutra. Single Stone Weight - 2.00 Carat. I1-I2 / Orange. 14kt Yellow Gold. Gold Purity & Color. Combined gemstone weight of 1 & 1/2 carats total weight represents a range of 1.46 - 1.57 cts. Our huge collection of products includes rings, fashion and wedding bands, bridal jewelry, pendants, gems and much more! 14kt Yellow Gold. Category Type:Gemstone Stud Earring. I1-I2 / Yellow. Gold Purity & Color. Combined gemstone weight of 2.00 carats total weight represents a range of 1.95 - 2.17 cts. Our huge collection of products includes rings, fashion and wedding bands, bridal jewelry, pendants, gems and much more! (Cut: Oval(10x12mm). 14kt Yellow Gold Diamonds Citrine Earrings. Citrine: 100% Natural. Style: Diamond Citrine Earrings. You will find hidden gem here. Gold Weight (grams): 4.96. 1) Ring Resizing. 2) Ring Redesign. These Beautiful Round Citrine earrings are prong set in 14k Y ellow Gold basket settings. This high quality, all natural stones consist of a deep color and pure clarity that is simply dazzling. Simple classic citrine earrings in prong setting.